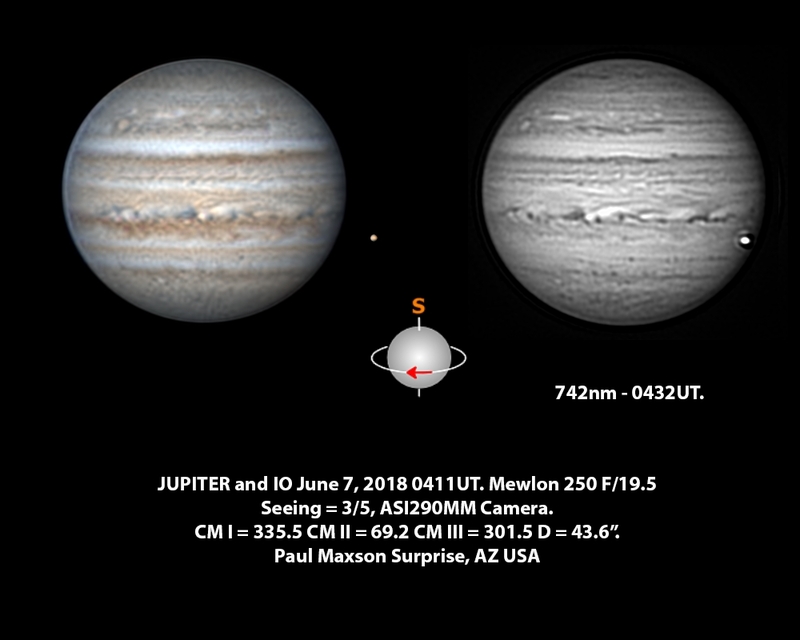 Here are Jupiter images from June 7 in decent seeing. Note Io next to the planet. Very cool, mate! This reminds me of the first time I saw Io march across Jupiter's face through my 7" Cass-Mak last year. I received the scope just a few days before opposition, and I received the motors and got them installed just in time for opposition night. Once set up for observing, I was thrilled to see that I also had a GRS transit well before midnight, so I could share with my whole family. We then saw Io approaching and confirmed through Stellarium that we'd get an Io transit with shadow (which I had only just first witnessed in 2014 through my C5/750 SCT). As Io crossed the limb into the disk, I was amazed that I could still see it trek across for about a third of the diameter before I lost it in the glare (whereas I'd always loose the moons to the limb through the SCT).